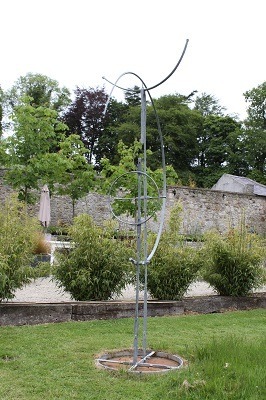 Q The best garden sculpture in Ireland? A According to Fionnuala Fallon in the Irish Times September 2017 here are ten Irish-based artists creating work suitable for outdoors: Gunvor Anhoj, Michael Calnan, Eilis O’Connell, Bob Quinn, Patrick O’ Reilly, Anna Campbell, Liam O’Neill, Killian Schurmann, Eileen McDonagh, Imogen Stuart, Alva Gallagher. Read the article. Q Where can I buy Garden Sculpture? A Calnan & Anhoj Metal Art Gallery, Russborough, Co. Wicklow, Lough Boora Park in Tullamore, The Irish Museum of Modern Art, Kildare Gallery at Carton House in Co Kildare, Lismore Castle in Co Waterford, Mill Cove Galleries Sculpture Garden, Shekina Sculpture Garden in Kirikee, near Glenmalure Valley in Co Wicklow, The Ewe Sculpture Garden in west Cork, The Solomon Gallery, Dublin. Q Where can I buy a water fountain? A You can commission Michael Calnan and Gunvor Anhøj to make a bespoke water fountain in bronze and copper. Q How do I pick a sculpture for my garden? A Make sure you love it and buy it because you love this and not because you think someone else would. It’s yours and it needs to resonate with you. You should be able to identify something of yourself with it. Remember it will grow on you over the years and give enjoyment. Q What is the price range for sculpture? Q What is the best type of sculpture for a garden? A Sometimes people like a sculptural piece that includes a function, i.e a birdbath or a bench or a water feature. But primarily people like a contemporary interpretation of a known object be it an animal or a fruit. A Allow the piece to migrate through multiple locations – don’t be too set about this. You could situate it in the middle of a lawn or try in the flower bed. You could also try an area that gets a lot of sunlight. We will help you make this decision when we install the sculpture! 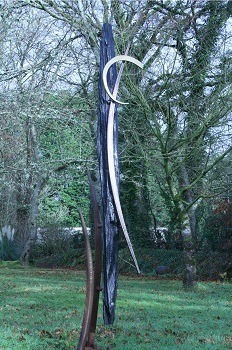 Q How can a sculpture enhance a garden? A Depending on the design of the piece it can set a mood. Create a pocket of interest within a specific space of your garden. Sculpture can break symmetry, offer colour and introduce materials not associated with a garden but maybe tie in with the fabric of the house. A water feature gives sound movement and aesthetics. Q Is there any maintenance required once the sculpture is in place? A Garden art often attract birds! Bird poop can easily be cleaned off with soapy water and a soft rag. Q Where can I do a blacksmithing course? A You can do a blacksmithing course at the Calnan & Anhoj Forge, Blessington, Co. Wicklow. Q Where can I do a blade smithing course? A You can do a blade smithing course at the Calnan & Anhoj Forge, Blessington, Co. Wicklow. Q Where can I make a knife blade? A You can forge a knife blade on a one-day course at the Calnan & Anhoj Forge, Blessington, Co. Wicklow. Q Find a blacksmith near me? Q How can I become a blacksmith?